Is the evangelical movement careening toward a cliff? Are we about to enter a recession of our own? John S. Dickerson thinks so. 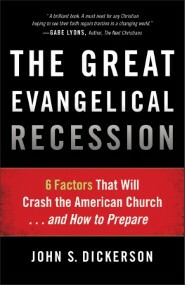 He is the author of The Great Evangelical Recession: 6 Factors That Will Crash the American Church…and How to Prepare and senior pastor of Cornerstone Evangelical Free Church in Prescott, Arizona. I’ve invited him to the blog for a conversation about the future of evangelicalism. Trevin Wax: Your book is divided into two halves. The first half looks at six trends of evangelical decline. The second half offers six solutions for recovery. Let’s start with some of the elements of decline. You write that evangelicals have an inflated view of our numbers and influence (as well as our financial stability). What’s the reality? John Dickerson: The bottom line is that we are a much smaller movement than many of us have believed – certainly not a majority of the United States, and, I believe, a gradually declining minority. Many of us attend growing churches that are attracting folks from other churches, so we have the perception that “the Church” is growing, when she’s really just shuffling. Meanwhile, as we play musical churches, the broader population is growing. My strength in journalism was taking boxes of data and making sense of all the information. In the same way, this book is the first of its kind within evangelical analysis. It aggregates lots of data from disparate researches. On this question of the actual size of the evangelical church, I discovered that four separate, credentialed researchers have recently used four separate methods to count U.S. evangelicals, in four completely independent studies. Interestingly, they all concluded that evangelical Christians are between 7 and 8.9 percent of the U.S. population. That figure will be contested, but I think the number is less important than the undeniable downgrade or recession in size and value. We still have some evangelical leaders claiming that “we” are 1-in-3 or 1-in-2 Americans. That just doesn’t seem to be the reality. Trevin Wax: One of the chapters is titled “Hated.” You focus primarily on the culture’s reaction to Christianity’s traditional view of morality. Is a “great evangelical recession” inevitable because of our views on issues related to sexuality? If not, why not? It’s important to note that the “evangelical recession” I write about is not the end of Christ’s Kingdom in the U.S., but the decline of American evangelical Christianity as we have known it. In that sense—the decline of evangelicalism as we’ve known it—yes, the changing moral landscape of America will inevitably continue pushing evangelicals to the periphery and into oppositional conflict. That said, Christ’s actual Kingdom can thrive in hostile cultures. Scripture is always our standard, and in Scripture we see the Church flourishing spiritually in antagonistic cultures like Rome, Ephesus and Corinth. The first century church surged as a movement, not because its beliefs were congruent with the culture, but because Christ’s power was working through committed disciples who were in gracious conflict with the culture. Our conflicting views with “the culture” do not limit almighty God. If anything, they give us opportunity to depend on Him as never before. The same Holy Spirit who empowered the church in Acts is waiting to empower the American church in the 21st Century. It is my hope that the difficult changes in American culture will humble us—to the point that we depend on Christ alone and the power of the cross in new ways. Trevin Wax: The cover story of Christianity Today in August 2011 was written by Bradley Wright, a sociologist who claims evangelicals are actually well-liked by Americans. How does Wright’s research contradict or correspond with your own? John Dickerson: Dr. Wright’s recent work, as I understand it, focuses a lot on how we are liked or disliked by the broader culture. While that analysis may be helpful, I personally don’t care too much about what percentage of Americans “like” us. In the book, my research focuses on whether or not we are fulfilling the Great Commission and bearing fruit. My concern is that we are dropping the ball on those bigger matters. It could be possible to be very liked by the culture – while failing to share the Good News. It’s also possible to be very hated – while successfully sharing the Good News. In either case, what the culture thinks of us is not the standard. Whether the Gospel is spreading, that’s the standard. In The Great Evangelical Recession I argue that, by the standard of the Gospel’s spread in the United States, we have a lot of room for improvement. My heart – in both the problems I document about the Church and the solutions I suggest moving forward – is not that we be liked by the culture. My heart is that we be faithful to Christ, that we re-elevate Him as the true Head of the Church, that we re-anchor in Scripture and rediscover the power of the Holy Spirit to empower the Church. Based on what Jesus said, I do expect us to be hated in this world, but that’s sort of a footnote in the book. The real questions I ask in the book are: Are we fulfilling our purpose as Christ’s presence in the United States? And, are we being the ambassadors of “good news” that Christ calls us to be? Trevin Wax: You claim that evangelical churches are bleeding out young people. How do you respond to those who say this exodus is exaggerated and that many young people leave the church temporarily, only to return once they are married or have kids? John Dickerson: Let’s say they all do return in their 30’s – after a decade of choosing their career, lifestyle habits and spouse apart from the Lord. Would that really be an acceptable state of discipleship? These are the years when most Americans determine their life trajectory, and we’ve got American leaders acting like it’s no big deal if most our people drop out during those years. I wonder if Jesus of Nazareth would hear that most His disciples left for 10 years and shrug it off as no big deal. So, even if those “optimists” are correct about many returning, we are still failing at discipleship. But, you’re correct. I do disagree about how many return. I hope I’m wrong about the exodus of younger evangelicals. I hope all the researchers are wrong, too. Unfortunately, the claim that “most of them return” assumes that culture in 2013 is functioning the same way it functioned back in 1983 or 1993. That’s a big and flawed assumption to make in the face of obvious, rapid cultural change in the United States. Anecdotally, most of us know former-evangelicals who are now in their 30’s. They’ve had their divorce and their kids. They’ve hit their “rock-bottom,” and they still want nothing to do with church – because they don’t believe in God or the Bible anymore. These folks have not casually wandered. They have adopted a philosophy and worldview that deeply contradicts evangelical Christianity. Technically, on this one, both camps have to argue from anecdote and opinion, because we won’t actually know how many will return until about 30 years from now. What I mean is this: the recent 18-29 year olds of the 21st Century, they just recently turned 30. Some of them might return in their 40’s or 50’s or 60’s. Ironically, by that time, many of the people who say “the kids all return” will actually be in heaven. Maybe they will look down and see that they were correct. I hope so. I prefer to acknowledge today’s bad news and adjust course—rather than explain it away. And truly, I hope we can all work really hard over the next 30 years to prove me wrong. Let’s give our lives to prove these optimists right. Though, even if “many” do “return,” we still have to ask ourselves, What about our discipleship is causing the majority of our people to leave during the most formative years of their adult life? Nobody is contesting that that’s happening. Since we agree on that, let’s get to work figuring out how we can actually “make disciples” of our people. Trevin Wax: What role does the fragmentation of evangelicalism into distinct tribes and camps play in the “recession” you believe is on the horizon? What can Christians do to combat this tendency toward fragmentation? John Dickerson: In the book I get to spend two chapters – Dividing and Uniting – on these questions. This is one of my favorite topics, because Jesus spoke so often of the unity of His true believers (see John 17:20-23 in particular). The power of diverse churches working together was, in my estimate, the greatest strength of American evangelicalism during the 20th Century. And yes, the “fragmentation” of the “movement” plays a huge role in the present decline of American evangelicalism. Humanly speaking, it will take a miracle to combat fragmentation in the 21st Century. Presently, I see evangelicals falling into the same three positions they took during the early 20th Century, in the Fundamentalists vs. Liberalism debates. I see more evangelicals separating and defining themselves by who they oppose. This is really a new manifestation of Fundamentalism. Simultaneously, other so-called “evangelicals” are getting soft on Scripture and atonement. They are essentially reincarnations of the old theological liberals who sabotaged the mainline denominations. History demonstrates that those extreme oppositional and capitulating views both fail Christ and the Church over time. Back in the 1940’s and 50’s, Billy Graham, Harold Ockenga and Carl F.H. Henry, cut an intentional path between Fundamentalism and Liberalism. They avoided the militant negativity on one hand, and they avoided the spongy pluralism on the other. These men cast vision for an evangelical movement truly defined by both grace and truth. My heart, my real passion is for a new generation to step in where Graham, Ockenga and Henry once did, to rally evangelical believers around Christ again. I pray regularly that God will lift up a new generation of Spirit-led 21st Century Evangelical leaders who will clean that old path between the two extremes—the path that is uncompromising on doctrine and Scripture, but also gracious, loving and ultimately focused outward, toward the world we are called to reach. This was my driving passion in writing this book, to perhaps be a small voice in a bigger conversation toward evangelical unity in the 21st Century. It is a passionate prayer of mine that God raises up leaders like this for our generation – to lead souls and organizations down this road of uncompromising Grace and Truth. Biblical unity is more important than ever—but it’s also more challenging than ever. 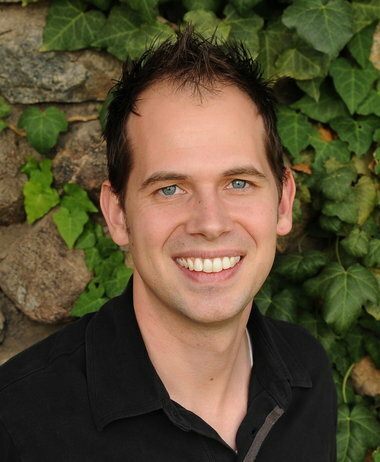 Trevin Wax: What can Christians do to combat this tendency toward fragmentation? John Dickerson: The book really digs into this, but here are a few passing thoughts. We have to stop tearing each other down, period. We have to actually believe Jesus’ words in John 17:23, when He prayed “May they be brought to complete unity to let the world know that you sent me and have loved them even as you have loved me.” (John 17:23). According to Jesus, unity is a guaranteed apologetic for His followers. Because Jesus took this seriously, we’d better start taking it seriously. We do have to graciously clarify non-evangelical departures from the atonement and the infallibility of Scripture, and part company when non-evangelical doctrines are held. We have to start local—by praying with and caring for other pastors and leaders in our proximity. We have to start praying for the Kingdom, beyond our own congregation and brand. At Cornerstone in Prescott, we often pray—by name—for other evangelical congregations in our city. We do this during our Sunday worship, as we pray that God’s Kingdom would truly come and His will would be done in our community. We must unite around Christ Himself as the Head of the Church—and around His simple Gospel message of salvation by faith alone in His work on the cross alone. Trevin Wax: How should evangelicals respond to the world’s condemnation of our stances on controversial social issues? John Dickerson: I get to unpack this in a chapter of The Great Evangelical Recession titled, GOOD. But here is precisely how we respond to a condemning world: “Live such good lives among the pagans that, though they accuse you of doing wrong, they may see your good deeds and glorify God on the day he visits us.” 1 Peter 2:12. I believe God’s Word. I believe it’s that simple. I believe we need to talk less and live out these “good lives” more. That is God’s prescription for a church in conflict with its host culture. This is a simple but very difficult paradigm shift for most evangelicals. We would rather use words and explain ourselves and argue our positions—than get our hands dirty helping the pagans who live closest to us. Trevin Wax: How do you respond to those who claim you are causing readers to doubt Christ’s unfailing promise to build His church? John Dickerson: Matthew 16:18 is actually one of the first Scriptures I reference in the book. Some point to that promise and say, “See? Christianity will never decline in the U.S.” But that’s not what the verse says. The promise is for the universal church around the globe. History teaches us – in Germany and England and Scotland – that the church can deteriorate in one country, even as it grows in globally. This promise of Matthew 16:18 gives us confidence that in the end, when the books are closed on humanity, Christ’s church will indeed have prevailed, but this promise should not cause us to lazily rest on our laurels as leaders in the American church. I don’t claim to be a prophet, but this book does have a prophetic tone. When God sent Hosea, Isaiah, or the other prophets, the message from God to his people was rarely that everything was peachy. We see the same thing with the 7 churches in Revelation, Jesus had very negative things to say to 6 of them. It’s interesting to me the self-confidence of some who act as if God could not possibly have any negative news for the American church. In the Old Testament and in Revelation 2 and 3 (the 7 churches), the negative critique always led to practical ways to return to God. That is the model this book follows. The entire second half is Scripturally-based, practical suggestions for us to return to Christ in our own ministries. For me, that second half, with all its hope and Scripture and practicality, that is my favorite part of the book. Despite the doom suggested by the cover, I believe those who read The Great Evangelical Recession will be encouraged, built up and biblically directed in shepherding the American church.